After a period of revision and editing (which included taking out one almost erroneous sentence that destroyed the entire book’s premise!) book three in the Jessica Daniel series is now nearly ready for release. I am hoping to have it available as a digital download on November 25, 2011. It will be a little more expensive than the first two books – but still cost under £3. Part of that is because it is longer. While books one and two are just under 100,000 words, The Woman In Black is almost 110,000. It might not sound like much but I do try to not just fill pages with waffle. It’s not ten per cent longer for the sake of it, it has that much more story in it. The other side of is that writing has become a massive part of my life and, if I can make a little more from sales of the title, it will give me slightly more freedom to work and hopefully continue to create. Rest assured, book four – Think Of The Children – will also cost less than £3 as a digital download when it’s available in 2012. I’m not looking to fleece people. 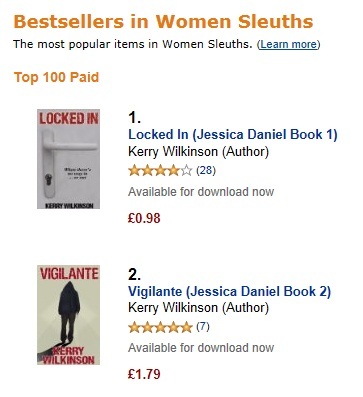 Meanwhile, as I’ve been busy working on books three and four, Locked In peaked at number two on the Kindle chart, while Vigilante has consistently been in the top-40. Locked In has also been the number one mystery book on Amazon, while that and Vigilante are the top two crime novels featuring a female sleuth on the site. I’ve had some very supportive emails and Tweets from people, which always make my day. Thanks to anyone who has contacted me and/or enjoyed the book. It makes it all worthwhile.